Wibit Sports Park – Want to Buy a real Water Wonderland? Sure, we’ve introduced you to all kinds of water toys, slides and pools, jet boats and water bikes. There really does seem to be an endless supply of water related gadgets and gizmos, but every now and then you come across the quintessential water amusement, the thing that makes all else pale in comparison, and that my friends, is what I found for you today. Behold the Wibit Sports Park 60, simply looking at it is enough to make you smile. The Sports Park is best described as a floating water playground, complete with a climbing tower, trampolines, a swing, a catapult and an obstacle track including a high jump, just for you and about 59 of your closest friends. The Wibit system is modular, and designed specifically so that they can be connected to other Wibit products using connector straps and anchor plates, making it easy to customize the super fun zone of your dreams. Read moreWibit Sports Park – Want to Buy a real Water Wonderland? All work and no play makes Jack (and Jill) a dull boy (girl applies here if you are talking about a girl, of course), so what kind of educational tools do modern kids get to enjoy? When I was a wee lad, I still remember how expensive a notebook was, and it only came with a CGA display, where the only kind of games that I played was Gorilla Basic and Nibbles. Fast forward to today, and you get plenty of kids who scream and kick up a fuss if either one of their parental unit fails to give them their iPad within minutes of their request. Having said that, modern day parents are also way more accommodating, but sometimes, it can be said that they are spoilt for choice as there are just too many items to choose from in the market. 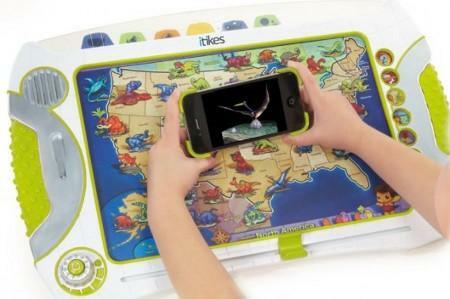 How about us making life a little bit easier on your side by recommending the iTikes? A more detailed explanation on what iTikes is all about can be found in the extended post. It was just a day or two ago that I told you about the Child Minder safety alarm. I found it a shame that our hectic lifestyles could put any of us in such a haze that we could actually forget our child in the backseat of the car. It’s an unbelievable tragedy and I thought the 70 dollar safety alarm had its place, even if it saved just one kid. But can the interest of safety go to far? As of February, one Florida county has an ordinance that requires all licensed daycare centers to install alarms in school vehicles that remind drivers to check for children upon vehicle shut off, and of course a patented device called Kiddie Voice was there to meet the call. Kiddie Voice, was specifically designed to make the driver walk to the back of the van or bus in order to deactivate the system. This feature ensures that drivers check all the seats before they leave the bus.